In honor of St. Patrick’s Day we’ve been talking a lot about the color green. 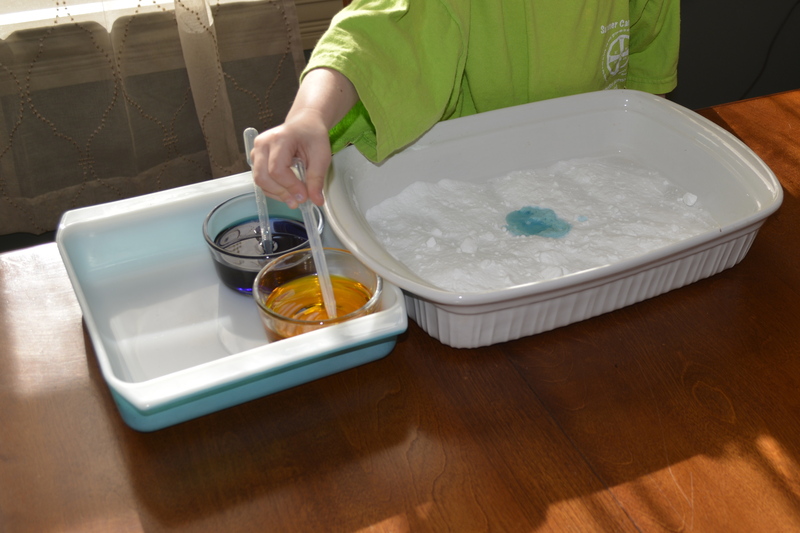 I gave each kid a tray of baking soda and a cup of blue and a cup of yellow vinegar. 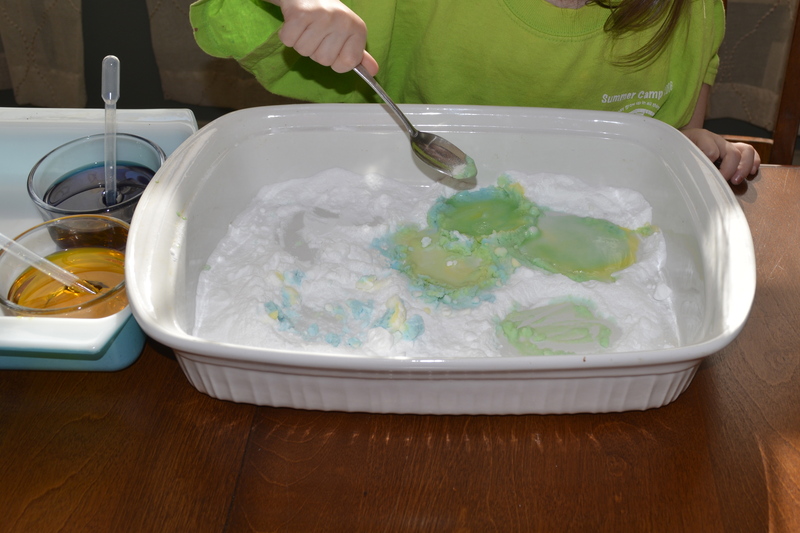 I wanted them to learn about mixing colors while learning about chemical reactions. Baking soda can dry the hands, so I tried to keep their hands out of it. Plus it’s just too messy! Length of time kids were engaged: 45 minutes – and they wanted to do more! I had some plastic droppers. It was hard for them to get the hang of it at first but they both caught on after awhile. 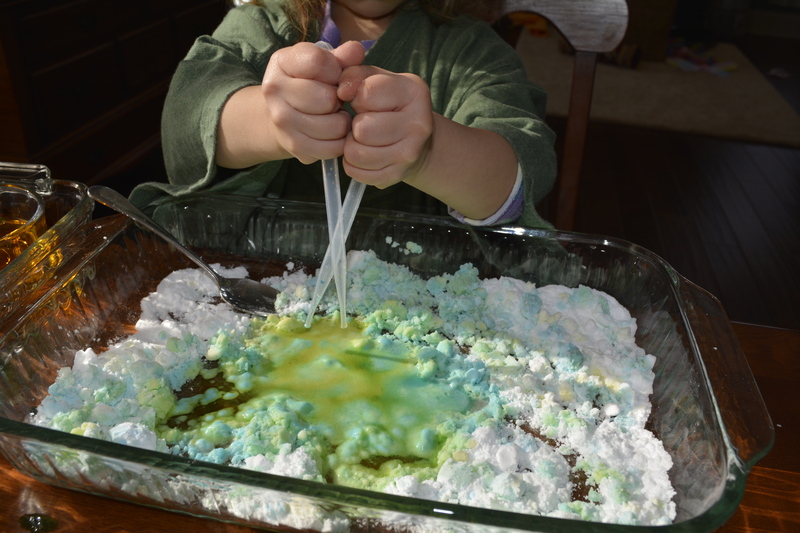 I had the girls make 3 circles in the baking soda with the spoon to make a shamrock. We talked about how the shamrock symbolizes the Holy Trinity and practiced making the sign of the cross. Then we dropped some green and blue into the circles and watched the colors mix to make green. It was really neat because the circles helped contain the colors and so we really got to see the color change before our eyes. There were lots of squeals and giggles with this activity! My older daughter accidentally put her baking soda covered spoon into the cup of vinegar. They loved the huge reaction and watching it bubble over! I happened to glance over at my little one and she was dumping the cups of vinegar into the pan! The kids were hoping the explosion would bubble over but it did not. 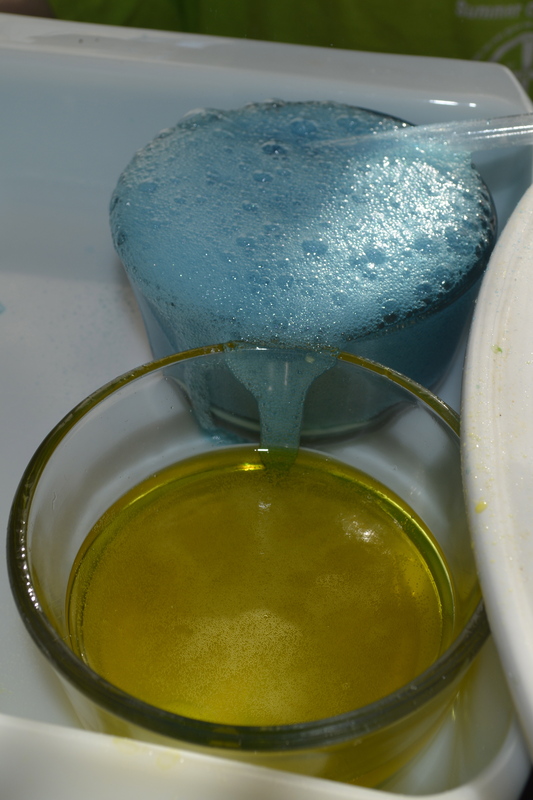 Another way to change up the activity is to use a shaker that contains baking soda to sprinkle it in the vinegar. 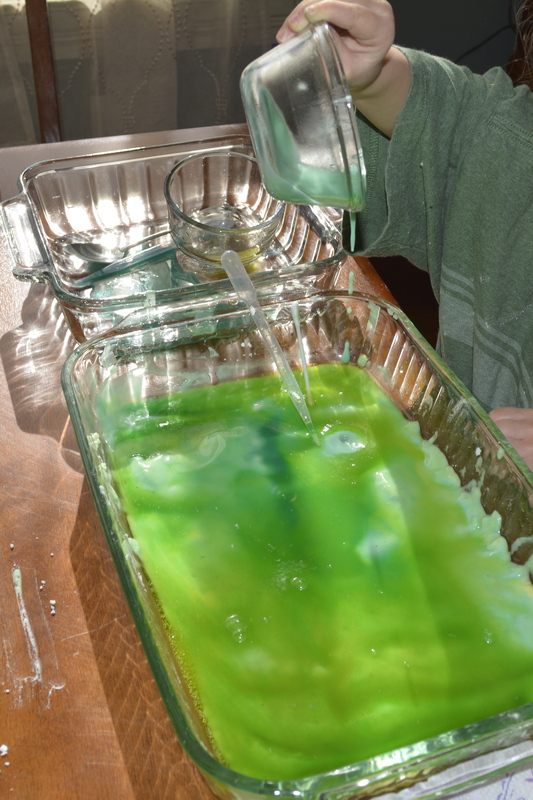 We did this once after we poured all the vinegar into the pan. 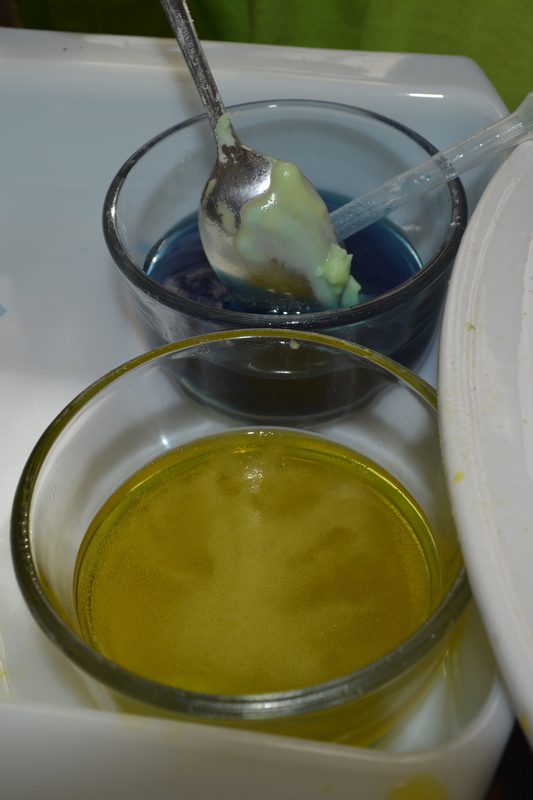 The reaction isn’t as big as using the droppers of vinegar, but it worked. It made a lot of little bubbles. It would probably work best if it was fresh vinegar that hadn’t reacted yet. It was still fun, though! Don’t have a shaker? You can make one! Take a container that has a tight fitting lid. Poke some holes in the lid and viola, you have a shaker. 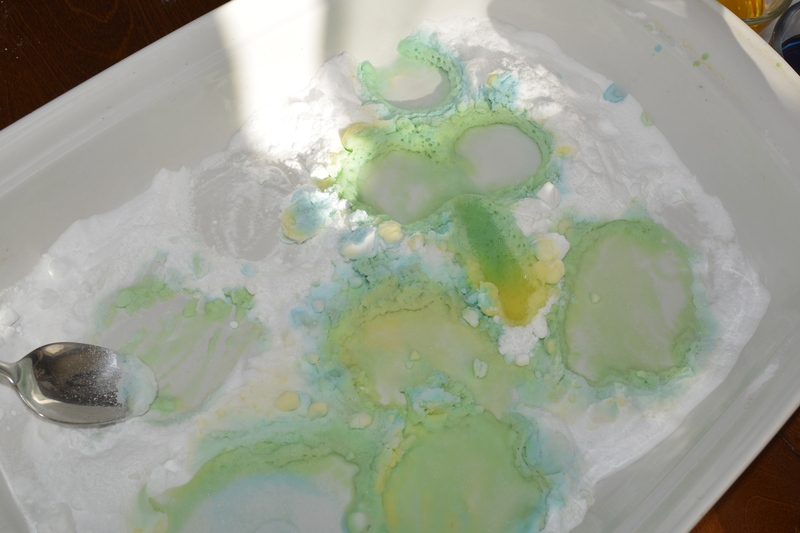 Eventually the baking soda and vinegar would not react any more. I noticed my 2 year old using her spoon to make designs in the baking soda. So I got out some q-tips to practice writing letters. 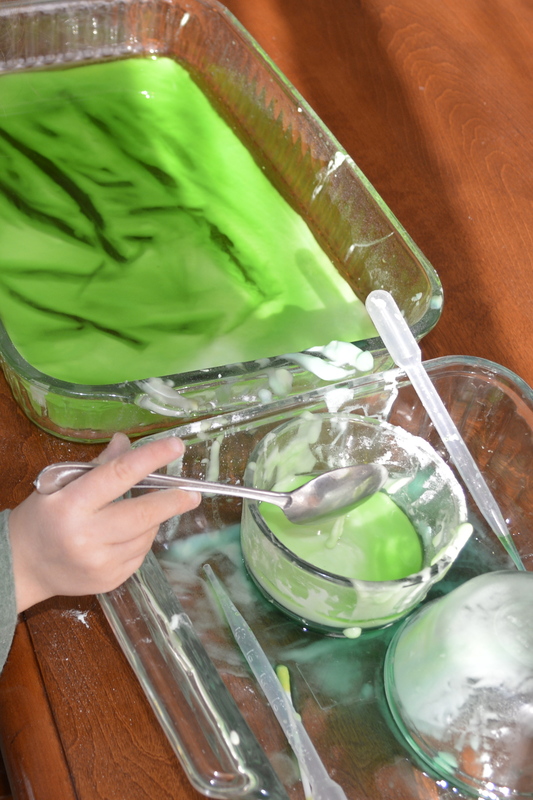 This was a huge hit with my kids. It really held their attention for a long time and they wanted more! I will definitely try this again. Maybe with vinegar in the pan and they drop in the baking soda. Did you try this activity? How did it go? I’d love to know! 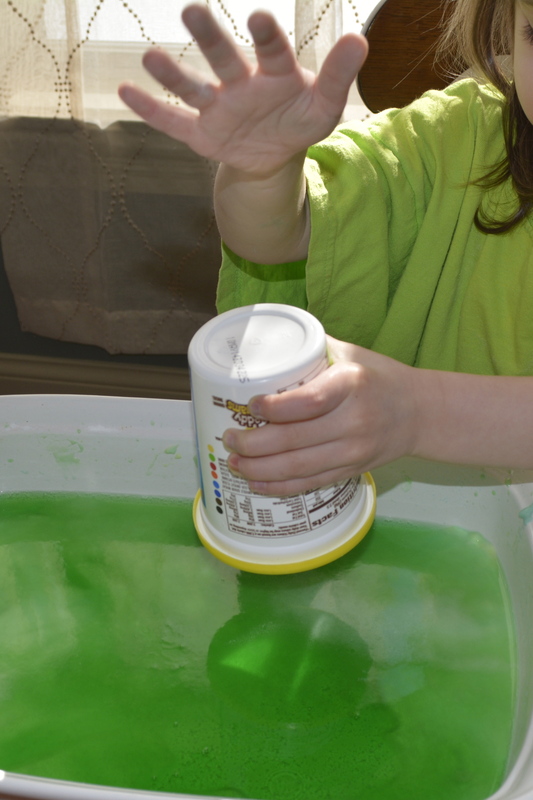 Posted in Activities, Teaching Kids and tagged baking soda, chemical reaction, shamrocks, sign of the cross, st. patrick, trinity, vinegar on February 27, 2015 by Kristina. ← Engaging Children in Prayer: Make a personalized prayer book!